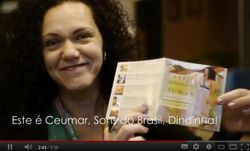 "Sons do Brasil - Dindinha", the first worldwide release by Brazilian singer-songwriter Ceumar was released by ARC Music at the end of October 2012, and entered the World Music Charts Europe this month at # 14. Ceumar ("say-ooh-mar”) combines Brazilian folk with influences from pop, jazz and samba in a unique way, as illustrated on this new release. Since the domestic release of her debut album in 2000, Ceumar has achieved popularity in her native Brazil, as well as the Netherlands, the country she now calls home and where she performs regularly. This, her first worldwide release, is a carefully selected collection of tracks taken from her four studio albums: Dindinha (2000), Sempre Viva (2003), Achou! (2006) and Meu Nome (2009). A live album, Live in Amsterdam, was also released in 2010. 'Sons do Brasil - Dindinha' was selected by the panel members of the World Music Charts Europe, fifty of Europe's most prominent and influential world music DJs, as one of their top releases for the month. Ceumar was ‘discovered’ in São Paulo in the early 1990s by Zeca Baleiro, who produced her debut album. Ever since, Ceumar has been recognized as one of the pearls of the Musica Popular do Brasil (MPB). Ceumar is not only blessed with a wonderful voice but also with a very special name. Ceu means heaven and Mar signifies the sea. When asked, Ceumar will reveal the truth of her name: it is a combination of her father’s and mother’s names. At home in the Brazilian state of Minas Gerais, the young Ceumar was exposed to the music of artists such as Milton Nascimento, Lo Borges, Clube da Esquina, Joyce and Boca Livre. When starting her own musical adventure, Ceumar tended to choose the less obvious road; she was not keen on singing the same songs ‘everybody’ already sang before her. This approach was reflected in her first shows, which she called “30 Músicas que você não ouve no radio” (30 Songs you don’t hear on the radio), and which contained songs by Egberto Gismonti, A Barca do Sol, Hermeto Pascoal and others.